A man walked into a small, tan hut. It was a humble shelter with simple tables, chairs and a stove. Light poured in through the round windows. There was a display monitor on the wall and a hologram projector in the middle of the table that stood in the center of the room. A broken down droid sat in pieces in the corner. It was a rusty, dark metal cylinder with wheels on two legs that protruded from its barrel-shaped body. The man walked to the center of the room next to the table. He was wearing a brown robe that covered his whole body, only revealing his bearded mouth. He scanned the room curiously. He paused and saw a white, battle scarred metallic helmet on the ground. It was a helmet of an imperial soldier. The two black-tinted eyes peered blankly as it sat motionless. The man reached his arm out revealing his hand. He knelt down and touched the top of the helmet. He turned it around. On the side it read “017B”. No doubt the number and name of the solider who wore it. The man picked it up. He sensed something different…something powerful about it. He turned around and walked back out the door to the small clearing outside. The hut was surrounded by a huge forest. The sky was a deep blue and a distant planet faintly glowed above. In the middle of the clearing was a large blast mark with small chunks of smoking, blackened shrapnel. He looked on the ground near the door. He saw a set of footprints evenly spaced that went toward the blast mark. Another group of footprints went from the door and across the clearing and then disappeared into the rich, green forest. The man looked at the helmet again, the face pointing towards his own. He concentrated on it and entered a meditative state. Laser blasts sounded all around them. A group of four soldiers wearing white armor and holding black, jagged laser rifles stood shoulder to shoulder. They were in a small town in the middle of a desert. The whole planet was a desert. There were white armored soldiers everywhere, along with giant metal vehicles whose powerful laser blasts crumbled buildings in their wake. The line of soldiers came to a house. They leaned against the wall, two on each side of the door. One of them pulled out a small round metal ball. “Stand clear. Commencing breach,” he barked as he stuck it on the brown metal door. They ducked their heads and crouched, pressed against the wall. A large deafening blast came from the door. Sparks flew everywhere, followed by a large puff of white smoke. They stormed into the hut with their rifles pointed in front of them. Once inside they scanned the hut methodically. There wasn’t much in it: a table, a few chairs and some old speeder craft parts. They checked each room until they came across a man and his son. They were huddled down, trying to hide. The man looked up in fear and charged the soldiers with a clunky metal tool. “Run! Run, son!” The boy ran out a back door. The soldiers shot the man down as he charged forward. His body fell to the floor, charred and smoking. His blood slowly seeping onto the ground. The soldiers ran to the back door. They saw the boy running in the distance into the desert. One of the soldiers pointed his rifle, paused for a moment, and then fired. A red, bright blast flew over the desert ground and pierced the boy in the distance, sending him to the ground where he lay motionless and smoking. The soldier who fired the shot and two of his companions walked back into the house. The other soldier looked in the distance where the boy had been shot. The tinted-black eye holes on his helmet stared blankly. He looked up at the sky at the twin suns shining overhead. “0-1-7 let’s move!” another soldier said standing behind him in the doorway. 017 turned around slowly and moved back into the hut following the others out on to the street. The firing had mostly stopped. Death lay on the ground in every direction. Corpses of different species lay burnt and smoking. Men, women, and children, it didn’t matter. If they had reason to suspect they were hiding information from the empire they were a threat and termination was necessary. The soldiers were lifting the corpses by their limbs and dragging them into piles where they were being burned. Blood stains splattered the ground and walls of the huts. The town’s speeder crafts and ships were nothing but smoldering piles of flame and metal. Soldiers came out of the huts, after clearing them, throwing the metal balls behind them. They made ear shattering explosions and poured smoke into the street. A large gray space transport ship hovered near the town just outside the perimeter of the huts and houses. “Let’s move out! Time to leave!” a soldier repeated throughout the town as the others jogged to the transport ship. 017 followed them as they made their way through the smoking streets to where the transport had now landed. Large gray loading ramps slowly dropped down revealing a dark cargo area. The soldiers loaded into the compartment in single file lines. A man in a gray uniform and a large circular helmet with a black visor stood at the top of the ramps with a data pad checking off numbers as the soldiers poured into the cargo hold. It was dark as all the soldiers stood silently. Small white, sterile lights glowed faintly above them revealing the black, metallic floor. 017 hated the cargo hold. He closed his eyes and let his mind drift away. He had been all over the galaxy on different expeditions. In his thoughts he could go wherever he wanted, only this time there would be no shooting, and no death. He imagined himself visiting different places without his armor on and without a weapon. He took a deep breath and sighed. The transport began to take off. Its engines roared and lifted off the ground. The soldiers felt some turbulence and balanced themselves. The engines exhaust gleamed blue as the ship raced toward the sky and broke out of the atmosphere. It headed toward a large triangular ship floating nearby the desert planet. On the bottom of the ship was a rectangular hole that was used as a docking bay so other ships could enter and leave. The transport full of the soldiers glided up into the rectangular hangar and landed on a shiny black floor. Bright white lights illuminated the hangar as different soldiers walked back and forth. Some wore gray suits, like the one that accounted for the soldiers on the ground. Some wore black metallic armor and others wore the same white armor as 017. The cargo doors of the transport opened slowly letting down the ramps. The soldiers marched out in their single file lines. They stood in formation just outside the ship as an older looking man wearing a gray suit walked in front of them. He wore an officer’s cap and a row of different color ribbons mounted above his right breast pocket. The officer reached the end of the line and turned to address the group. “Nice work today, unfortunately we did not find any of the intelligence we were hoping for regarding the location of the rebels. Our next stop will be the forest planet code named 0116-E. That is all, report to your quarters and wait for orders to be called over the intercom.” The officer walked away and left the hangar. The soldiers broke formation and walked slowly to the back of the hangar and flooded into different light-gray hallways. 017 walked to a door that had the same number as his name and battalion letter written on it: ‘017B.’ The door slid open and he walked into his room. A single bunk, a metal bench, a locker, a metal stall, and a sink sat in the white illuminated room. There was a display screen embedded into the wall near the sink. It was on idle and displayed a view of outside the ship. Stars twinkled in the distance on the screen as the ship left the desert planet’s orbit. 017 took off his helmet. He had black hair and tan skin. He had a warrior’s face with several small scars torn into it. He reached down and took off the rest of his armor and placed his blaster rifle into the locker. Underneath his armor he wore gray shorts and a gray tank top. He walked over to the sink and stared at himself in the mirror. He thought of the boy they had shot down. He looked at himself with disgust. He washed his face with cool water and dried himself off with a white towel. He went over to his locker and pulled out a silver plastic bag and sat down on the metal bench. He opened it and ate the contents. It was a packet of meat and some tightly packed bread. He ate all of it quickly and methodically. He then pulled out a small tube that he poured into a glass of water. It turned the water green and he gulped it down. He left the empty packaging on the bench and got up and turned off the lights. He climbed up on his bunk and pulled a white blanket over himself and rested his head on a pillow. He shut his eyes and let his mind drift off into a sleep. 017 found himself in a village in the middle of a forest. He was walking in a line with other soldiers as they shot down men, women and children. Screams rang throughout the forest. 017 saw a woman running away in the distance. He lifted his weapon and aimed at her. He fired and hit her in the back, sending her to the ground motionless. Explosions and screams burned his ears as he walked to a puddle of water. He stopped as the line of soldiers kept moving, firing at everything that moved. He looked down at the puddle and saw a reflection of himself. He could see he was wearing his armor. He knelt down and stared at his emotionless helmet. He set his blaster down and took off his helmet. He looked back down at the puddle, but did not understand what he saw. He had just taken it off, but in the reflection, he was still wearing it. He put his hands on his face and felt his hair, nose and ears but when he looked back at the reflection his helmet was still on. He screamed in horror and confusion. Explosions sounded all around him, tearing apart the soldiers and the civilians alike. They got closer and closer to him, but he didn’t care as he kept staring at his reflection in the water. The smoke and flames engulfed his entire body. 017 woke suddenly in a cold sweat. It was just a dream. “A dream?” he asked himself. Clones were not supposed to dream; they were not supposed to feel at all. 017 was having increasingly more dreams. Some were good, but most of them were visions of the atrocities he had committed. He was also beginning to feel more emotions. If he had a good dream he felt a breath of peace. If he had a nightmare he felt the horror and fear of everyone he had been ordered to kill. This time was different; he had never been awoken by his dreams before. He jumped down from his bunk and raced to the sink after flipping on the lights. He turned on the water and looked at himself in the mirror. He could see his face. He touched it to make sure he could feel it. Behind him he could see his helmet staring at him as it sat on the metal bench. He splashed water on his face over and over again. It wasn’t helping, and his hands were beginning to shake. He gripped his hands together and tried to take deep breaths but failed to calm his nerves. He walked to the entry door to his room and slid it open. He peered out and then slowly walked into the hallway. A small gray box-shaped droid on wheels quietly rolled passed him. Another humanoid looking droid, which was a dark gray metal with yellow eyes, walked passed him as well. It looked at him for a moment, but did not say anything. The droid’s eyes looked strangely sad. It glared at him then turned its head away and kept walking down the hallway. 017 turned and began to walk down the hallway. “Excuse me, what are you doing, clone?” A cold, female voice sounded behind him. He turned and saw a female officer in a gray uniform with a tightly kept bun holding her hair up. “017-B, ma’am,” he said clearly. “Come with me, 0-1-7,” she replied as she turned around and walked back down the hallway. 017 followed. They walked into a white, brightly lit room. There were different beds in rows along the walls. Clones were sprawled upon them. They were all dead. Officers in white coats were harvesting the bodies for organs to remake into other clones. The life of being a clone was to blow themselves up enough in battle, so they could not reuse the tissue or to be shot and brought back to be made into another clone destined for the same fate. It was rare a clone ever died of natural causes. If they did they were still reused. 017 had lived a relatively long life for a clone and was quite an experienced fighter. He was about three quarters through his potential life cycle. The female officer walked over to a desk and sat down behind it. She motioned for 017 to sit in a chair positioned in front of the desk. He sat down slowly, still looking at the clones being harvested. “Pay attention, 016,” she said. “Its 017, ma’am,” he replied respectfully. She gave him a quick glare and looked down at some papers on her desk. “What were you doing out of your bunk, clone?” she demanded. “I- I couldn’t sleep.” He was careful not to say a word about his dream. “I’m not sure what else to say. I haven’t been to the medical bay before. Not since I was a young clone.” 017 looked down. The female officer stared at him for a second. “You know that if clones are defective they are decommissioned and recycled,” she told 017. “I know,” he said with acceptance. She stared at him for another minute with curious eyes. He just stared down at his hands. She then opened a drawer and took out a small silver bag. “Take these, they will help you sleep. If you come back here you will be decommissioned. Do you understand, 017?” she asked. Her tone was less stern now. “Dismissed,” she said as she began to look through more papers on her desk. 017 slowly got up and started to walk out of the medical bay. “That medication is very expensive, it’s usually only for officers, not for clones. Don’t put them to waste,” the officer said behind him. He turned around and looked at her. She gave him a faint smile of reassurance. “Also, do not tell anyone I gave you those, or they might decommission me as well,” she said, in an almost humorous voice. 017 looked at her with curiosity. He had never been treated like that before by anyone, not since he was young. Any interaction with an officer was usually cold, dry and to the point. But this one had broken a rule for him, a clone. “Why would she do this for a clone?” he asked himself. He nodded to her and then proceeded to walk away, returning to his room. Back in his room he swallowed the pills that were in the silver bag with a large glass of water. He stood in front of the mirror and looked at himself. He felt his body relax. His nerves calmed and settled. Everything became slightly blurry as he got very tired very quickly. He managed to walk over to his bunk and climb back into it. The lights were still on as he drifted into a deep sleep. 017 found himself in a room where he studied hand-to-hand combat as a young clone. Other clones were in there as well practicing different techniques on each other. A being of a different species was watching over them. Their skin was a light blue color. They had long necks and round eyes. Another young clone was in front of 017 and began to charge at him. 017 tried to evade his attack but the other clone grabbed him and pinned him down on the floor in a headlock. 017 was supposed to surrender but tried to fight back instead. The other clone tightened his grip. 017 felt tremendous pressure throughout his arm as he heard a snap. He screamed in pain. The other clone let go and jumped up in shock. 017 lay on the ground and held his arm in pain. One of the blue beings walked down to where they were and gently picked him up. It carried him to a room where it set him upon a bed with white sheets. It smiled at him and gently took his arm and wrapped it up in a thick, sticky bandage that formed and pressed around his arm. “There… better? It will heal with time young one,” the being said in an echoing, but soothing voice. He looked up and then down at his arm. Tears still ran down his face. The being then gently placed its hand on his head. It calmed him and he put his head down and closed his eyes. “All troopers, please report to the hangar immediately. Please report to the hangar immediately to your respective battalions,” a voice sounded over the speakers and an officer was displayed on the screen in 017’s room. He woke up and jumped out of his bunk. He must have slept too long. His throat was dry and parched. He quickly drank a glass of water and scrambled to get his armor on. He put everything on but his helmet which he picked up and looked at it for a moment remembering his dream. The voice sounded again telling all troopers to report to the hangar. He placed the helmet on and grabbed his blaster and swiftly walked out of his room. The hallway was filled with other soldiers as they jogged down the hallway. 017 followed them. They came into the hangar and walked to where their battalions were forming up. “Let’s go! Load up, troopers!” an officer in a large black helmet barked at them as they began to walk up the loading ramps and into the transport ship. They stood in single file lines as the doors closed and the transport’s engines started lifting them off and out into space. 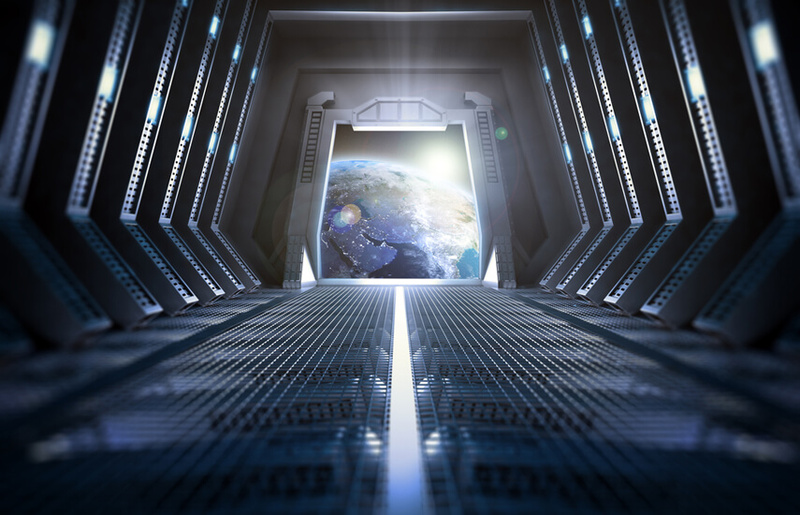 “We are approaching 0116-E. We have reason to believe Jedi have taken refuge here. Your mission is to eliminate all villages until the Jedi are found. Prepare for combat, troopers,” a cold voice sounded over the speakers of the cargo bay where 017 and the other soldiers stood. The voice ceased, and the soldiers stood in the dark waiting to land. 017 remembered his dream of how the blue being treated him. He then thought about the officer last night and how she broke a rule for him. He also thought about the dream in the forest where he couldn’t see his face. He closed his eyes and tightly gripped his weapon. “30 seconds until landing. Get ready troopers we are coming in hot!” the voice sounded over the speaker again. They felt a jerk as the ship landed and the loading doors opened letting down the ramps. They revealed a teeming, rich green forest and a village of tan huts. Lasers were being fired and explosions blew sparks and smoke into the air. Another battalion was already there and had begun to clear out the village. The soldiers in front of 017 poured down the ramps and he followed them onto the ground. He heard screams of villagers being slaughtered. He looked around at the horrific scene as soldiers methodically shot down everyone in sight. Red lasers flew all around him with deafening explosions sounding throughout the village as he stood in place, his weapon lowered. “017 you are in violation of a direct order, get your weapon and start clearing out this village or I will have you decommissioned effective immediately! Get moving!” the other soldier shouted. 017 stood motionless. He stared at the village again and at the people being scorched by laser blasts. He then kicked the soldier in the legs tripping him and knocking him to the ground. He started to run away from the village and the horror and began to feel something he had never felt before. He felt as if he could run forever. He felt light. “Get back here 017! Get him! Get 017, he is a deserter!” the soldier shouted at three others that were nearby as he picked himself up off the ground. 017 ran through the forest as fast as he could. His legs began to tire but he didn’t care. He was trained to run for a very long time. He could hear the yells of the soldiers chasing him as the screams and explosions coming from the village faded away in the distance. Sweat poured down his face as he ran through a final cluster of trees before running into the middle of a small clearing. There was a tan hut on the edge of the clearing opposite to him. Muffled explosions could still be heard in the distance as well as shouting coming from the soldiers chasing him. His armor was dirty and scratched. He ran over to the hut and opened the door slowly. He walked inside to a humble room. The round windows let the sunshine in. A woman and two young children were huddled on the ground in fear. They stared at him in terror. The woman hugged her children tightly and peered up at him with pleading eyes. 017 stared back through his helmet and remembered his dream. He removed his helmet revealing his face. He now felt something else; he had felt it before when the boy was shot on the desert planet, but it was stronger this time. It was so strong it felt like his chest was going to burst open. He had to keep this family alive. He didn’t exactly know why, but he knew it was right. For the boy in the desert’s sake and every other person who was shot down before him. He had never made a conscious decision to follow what was, he thought, was right before. He followed orders his whole life without hesitation. He understood now that he had a choice. He could choose what to do, and he knew exactly what he was going to do. It felt liberating and his chest felt like a huge weight was lifted from it. His mind felt alive as his heart raced. He dropped his helmet on the floor and put his finger in front of his mouth and motioned for them to keep quiet. The shouts of the soldiers chasing him could be heard getting closer. He smiled and winked at them as he gave his blaster to the older child. The child took it carefully and looked at him in wonder. 017 stood up straight and smiled at them and then nodded. All the woman could do was stare back. “When you hear an explosion run north and don’t stop,” 017 said with confidence. The woman nodded. He turned around and opened the door and closed it behind him as he walked back out into the clearing. He took a small metal ball that was in a white container mounted on his lower back. He held it casually in his hand as he walked slowly to the middle of the clearing. The four soldiers ran out of the forest and surrounded him with their rifles pointed. “017 you are in violation of direct orders. Where is your helmet trooper! ?” the soldier screamed at him. “I lost it,” 017 said bluntly. “Kneel down 017, kneel down with your hands in the air! Do it!” the soldier screamed. 017 closed his eyes and pressed a button on top of the metal ball. “Kneel down!” the soldier screamed again. 017 didn’t respond. He kept his eyes closed and basked in this new feeling. It was a feeling so humbling and yet so proud. For the first time he felt serenity. For the first time in his life he felt human. He could feel it igniting his entire body. He opened his eyes again. He spun around and threw the ball towards the soldier screaming at him and let out a loud roar. The soldier aimed his blaster at 017 just as the ball exploded in the air. A black and blue blast engulfed 017 and the four soldiers, disintegrating them. The smoke settled leaving only a black blast mark on the dirt with a few pieces of smoking shrapnel. The woman and two children ran out of the hut and headed north. The child with the blaster looked at the blast mark as they ran passed. They disappeared and escaped into the forest. The hooded man in brown robes stood over the blast mark still holding 017’s helmet. He could sense something happened that was very important to whoever had worn this dirty, tattered helmet. The man smiled gently and walked back into the hut. He walked inside and looked at the sun piercing through the windows. He placed the helmet on the table and bowed before it and smiled. He left the hut and walked back into the clearing where other men and women in robes were running through the forest with glowing green and blue swords raised in their hands. He let his robe drop to the ground revealing his tan padded armor. He pulled out a small metal handle that ignited in a glowing blue sword. He began to run and followed the others. The hut sat in the clearing unharmed and untouched. 017’s helmet sat on the table still, covered in dirt marks. The sun’s rays illuminated it as it sat where it now belonged. Tyler Pesek grew up in a small town in Northern California and spent his childhood days playing “Star Wars” and “The Lord of the Rings.” Starting at a young age, he was fascinated with heroes and stories of self-sacrifice. He always had an active imagination, often daydreaming in class instead of paying attention and would write out his ideas. After stumbling through high school and moving a few times afterwards, he joined the Navy and spent 6 years in the service as an Electronics Technician. Going through many crucibles as he traveled the world during his time in the Navy, he was often inspired and even found time to write! He completed a draft of his first book and the short story "The Storm Trooper." He is now settled in Fort Collins, Colorado, where he works as a technician by day and is a writer by night. Tyler can be reached via email at tylervpesek@gmail.com. Read more articles by Tyler Pesek. All original work attributed to Tyler Pesek © 2018 Tyler Pesek.